To fix U.S. finances requires a compromiser-in-chief. Who is best suited to be the next compromiser-in-chief? Who is best suited to be the next compromiser-in-chief? That may be the most important question American voters will have to answer when they head to the polls to elect a new president on Nov. 6. A sweeping, bipartisan agreement to reform the tax code, cut spending and ensure the safety of entitlement programs is an essential precondition for stabilizing the country’s finances and getting the economy back on track. While neither President Barack Obama nor Mitt Romney is willing to cast himself as a softie, the Republican challenger may have a slight edge when it comes to the issue. During his term as Massachusetts governor, Romney was forced to work regularly with Democrats, who overwhelmingly controlled the state legislature. By contrast, the Obama administration’s signature legislative triumphs have been largely party-line victories. |Consider Obama’s three biggest achievements since taking office in January 2009. His fiscal stimulus bill was opposed by all Republicans in the House and included just three yeas from Republican senators - Northeast moderates Olympia Snowe, Susan Collins and the late Arlen Specter, who later switched parties. Obama’s healthcare bill garnered no votes from the other side of the aisle in either chamber. The Dodd-Frank financial reform law was upheld by three Republicans in the House and three senators, again Northeast moderates. Romney bridged the partisan divide when running the commonwealth of Massachusetts. As the former Bain Capital founder took office in 2003, Democrats controlled 85 percent of the legislature. Still, he managed to convince them to give him special powers to unilaterally cut spending to avoid a shortfall of more than $2 billion from an annual budget of $23 billion. Moreover, his strategy wasn’t one-sided: although he closed the gap without raising personal taxes, he eliminated corporate tax loopholes and raised fees to increase revenue. Surpluses resulted in the years that followed. Similarly, Romney worked with the Bay State legislature to pass what at the time was widely regarded as the most comprehensive effort at healthcare reform in the country, and which became the basis for Obama’s Affordable Care Act. Though he made some line-item vetoes, Romney signed the act into law in 2006 after two years of rigorous back-and-forth between the governor’s office and the Massachusetts House and Senate, which voted 154-2 and 37-0, respectively, in favor of the bill originally proposed by Romney. Washington is, of course, a lot more complicated than Boston. Whoever wins in November will face a massive national challenge bridging the polarized positions of Republicans, who are entrenched in their opposition to tax increases, and Democrats, who pledge to fight tooth and nail to preserve spending on Medicare and Social Security. 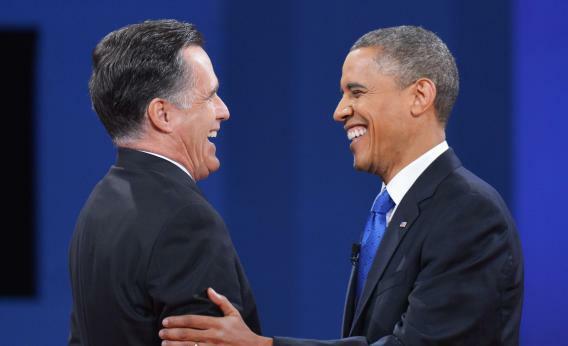 As a second-term president, Obama might have less to prove than Romney, who naturally would aspire to a second term. But Romney’s advisers have suggested their candidate would risk being a single-term leader if that’s what it took to make tough decisions. They’ve even invoked the record of James Polk, the technocratic 11th U.S. president, who declined a second-term run. True, it is difficult to take such promises at face value given Romney’s Etch A Sketch approach to all manner of issues. On the other hand, his seeming lack of fixed ideological positions may give him more negotiating room in the Oval Office. Either way, Romney’s record as governor provides a notable contrast to the president’s past four years. Indeed, it’s a wonder Romney has not made more a virtue of this, preferring to attack Obama’s healthcare reform instead of trumpeting his own bipartisan achievements. These shortcomings diminish Romney’s potential as a compromiser-in-chief for legacy-setting fiscal reform. He does nevertheless still hold the edge.